We at the ABA were very sorry to hear of the passing of California birder Rich Stallcup, who died this week following a long illness. Rich was undoubtedly one of the giants of North American birding, the recipient of the ABA’s Ludlow Griscom Award for Outstanding Contributions to Regional Ornithology in 2002, and a man whose kindness and knowledge are felt far beyond his Marin County home. I can’t count myself among the fortunate folks who’ve spent a lot of time in the company of Rich Stallcup. However, occasionally, our paths crossed and we corresponded via email. The timing of Rich’s passing has re-impressed upon me the mysterious ways of the universe and how events seem to intersect far more often than the laws of probability and chance might suggest. Several days before he died, I read a captivating piece of prose by David Gessner in Orion magazine entitled “Brant’s Requiem.” Gessner’s work of fiction focused on the last week of life of writer-poet “Kenneth Brant.” Firmly grounded in the naturalist tradition, Brant’s work embodied bioregionalism—drawing inspiration from the patch of ground and surrounding area he called home. Brant’s final days at his homestead near “The Cape” were enlivened by spending time with a younger poet and videographer who’d offered to help Brant put his field notes in order and tape several interviews before it was too late. David Gessner’s “Brant’s Requiem” was a moving, evocative work of prose. More importantly, it reminds us of our place in the Circle of Life. Namely, that mentors and others who have inspired us deserve mention before their walk down the Great Passage. We’re limited only by our imagination: newsletter articles, interviews, or simply connecting with a mentor for a walk to look at birds or plants are all suitable tributes. Rich’s passing got me to thinking: one measure of the Great Ones is their ability to influence people they’ve never or only rarely met. Rich is well known, along with C.J. Ralph, as the discoverer of the amazing spring and fall vagrant phenomenon on outer Point Reyes and other migrant traps along the coast. 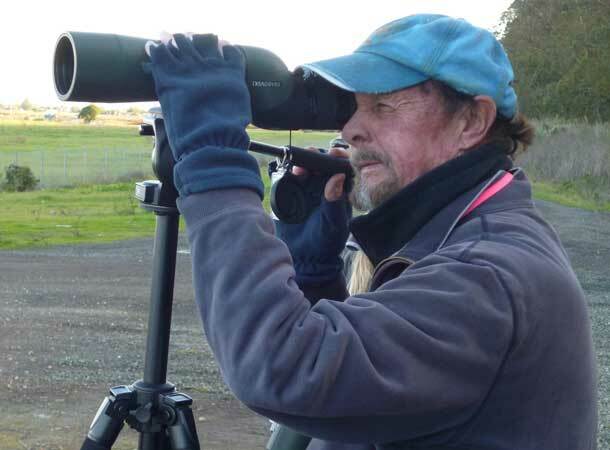 To say that we birders have followed in Stallcup’s–as well as Guy McCaskie’s–footsteps is to state the obvious. For instance, I birded Humboldt County hard—Elk Head, the Rose Patch at Clam Beach, Fairhaven—on September 6 and 7, 1996, without a migrant to show for my efforts. I’d heard that Rich sometimes employed his vagrant-chasing “lite” strategy: driving coastal locations slowly, with the windows rolled down, to listen for chickadee flocks. So, the next day, I emulated his technique along Scenic Drive between Westhaven and Trinidad. Bingo! I got onto a megaflock that included five species of warblers, with a Magnolia Warbler being the highlight. My appetite whetted, I returned on September 27, heard chickadees, and stopped. The flock included a Yellow-throated Vireo! Over the next two days, a grand, local “Patagonia Picnic Table Effect” ensued, with many of Humboldt’s most-ardent birders tallying the following species: Willow Flycatcher; Blue-headed Vireo; Chestnut-sided, Hooded, Blackpoll, Nashville, Palm, Hermit, and Black-throated Gray Warblers; Sage Thrasher; and Vesper and Brewer’s Sparrows. Finding a 3rd Humboldt record Yellow-throated Vireo would have been fulfilling enough, but to have discovered a hotspot delivered an adrenal rush not soon forgotten—one I owed to Rich. I didn’t have any contacts, so I did the next best thing: went to Table Bluff to do a seawatch. About a half-hour of searching produced nothing noteworthy. Then, a lumbering Pink-footed Shearwater suddenly appeared in the same field of view as my target species. Success! And having the two birds side-by-side for comparison made me certain of the ID. Although I felt good about my sighting, I knew that my desire to keep pace with John had the potential to cloud my judgment. So, you can imagine my relief when Stallcup visited Humboldt a day or two later… and saw Black-vented Shearwaters offshore from Table Bluff. Rich led an annual spring herpetology trip that brought him to Humboldt. The skilled überbirder that he was, you’d better have your schedule cleared for several days or have an incredibly understanding boss or professor, because you knew you’d be springing into chase mode. Tufted Duck and Franklin’s Gull come to mind, and there were undoubtedly other noteworthy birds located during the search for amphibians and reptiles. all things avian within the borders of our Golden State… and beyond. Rich’s status as a respected ornithologist and accomplished writer made him a logical choice to be asked for a jacket quote for the “Atlas of the Breeding Birds of Humboldt County, California.” His generous words in support of the publication furnished a welcome capstone to the 10-year effort. Rich’s enthusiasm for avian projects large and small was well-known. When my first piece appeared in Birding—detailing a Barred Owl’s probable predation upon a Spotted Owl—Rich’s email was the first I received offering congratulations. Fittingly, the first time I bumped into Rich was during fall at Point Reyes. John Sterling and our merry band of Vagrants were venturing beyond the Redwood Curtain, en route to desert oases. Rich was leading a field trip, which didn’t allow much time for chatting. But he had a presence about him, one amplified by meeting him on his home ground. I read yesterday online that in the 42 years since he’d co-founded the Point Reyes Christmas Bird Count, he’d never missed one, underscoring his relationship to that special place. It seems to me that Kenneth Brant’s Cape and Rich Stallcup’s Point are an apt analogy: people whose lives have been replenished on a daily basis through their interactions with their home ground. And they’re not the only ones: Witness Guy McCaskie in the Tijuana River Valley and Salton Sea. Jon Dunn in the Owens Valley. Kristie Nelson near Mono Lake. Todd Easterla in the lower Sacramento Valley. Bruce Deuel in the northern Sacramento Valley. Gary Lester and David Fix in Humboldt. Alan Barron in Del Norte. Jim Lomax, John Luther, John Sterling, and others who’ve expanded the definition of home ground to encompass all of California’s 58 counties. Space precludes mentioning all of you, but you know who you are and what your home ground means to you. Thanks, Rich, for sharing your knowledge and illuminating the unique nature of each spot—and the benefits of becoming intimate with our home ground.